Ben Clark is enthused by the “exciting challenge” that lies ahead of him as manager of National League club Gateshead. Clark was named as successor to Steve Watson on Monday after the former Newcastle United defender agreed to take over at York City. Fitness coach Ian Watson has stepped up to become assistant manager and former Newcastle defender Mike Williamson will also form part of Clark’s coaching-staff. 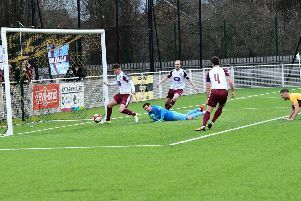 The 35-year-old will take of his first game in senior management when the Heed travel to promotion-chasing Salford City on Saturday and he admitted that he is already looking forward to taking on one of the National League’s big guns. “I wish the game was tomorrow if I am honest,” explained Clark. “By the time we kick-off it’ll be two weeks since our last game, so we are really keen to get things going again. “This club has been close to my heart and obviously I have been here for a while now. “It’s the only place I wanted my first managerial role to be and it’s an exciting challenge to take on. “It won’t be easy, especially starting with a game like Salford, and we need everyone pulling in the same direction, but we believe we can move things forward. “It was difficult to see Steve (Watson) and Micky (Cummins) leaving the club because they are mates, but it’s now about what we can do. “I have a great opportunity in front of me and I want to take it. One of the big challenges lying ahead for Clark is dealing with a Heed squad shorn of the services of former loan stars Luke Armstrong and Luke Molyneux. 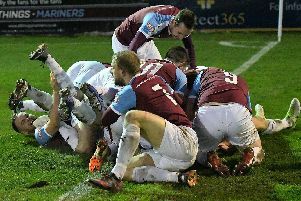 Watch sensational late winner as South Shields go clear at top of table against Farsley Celtic. Armstrong returned to Middlesbrough at the end of December and signed a new deal with the SkyBet Championship club before agreeing to a loan move to League One side Accrington Stanley. Molyneux is now back at Sunderland and will be hoping to find his way into Jack Ross’ first-team plans over the next three months. Clark is unable to recruit new faces as Gateshead are currently subject to a transfer embargo imposed on to them by the National League in September. The former Hartlepool United defender is hopeful that he will be able to bring in new faces soon, but admitted that he would have to leave that to other key figures at the club. He said “It’s not ideal and obviously losing the two Lukes was a big blow. “It was great to see Luke Armstrong making his Football League debut and that was part of the reason he came here. “He got the rewards and he will go on to have a great career. “We have a small, tight-knit squad and, in an ideal world, we would bring in reinforcements. “We are under embargo and I can’t do anything about that. Long-serving General Manager Mike Coulson was named as the club’s new Head of Football Operations on Tuesday morning. He spoke at Clark’s unveiling and confirmed that work to have the embargo lifted is ongoing. “The embargo is still in place and I spoke to the National League on Monday to see what is required for it to be lifted. “Michael Williams is working with the accountant to provide them with the necessary paperwork to give them to comfort to lift the embargo.